— This implies that Gaza is a sovereign country bordering Israel, not the prison for Palestinian refugees that Israel established decades ago in the south of Palestine. — When someone is morally at fault, the situation is always “complicated.” As we shall see, the “many at fault” are always Palestinians, not Israelis. — “Tragedy” in Greek theater held that events are written by our fate and could not have been otherwise. If Zionism had not chosen Palestine in the late 1800’s and then proceeded to steal land from Palestinians from then on, it could very much have been otherwise. There was an actor here; there was a cause, and an effect. The cause of the “tragedy” was Zionism. Ask the settlers to return to their own countries, and the “tragedy” would end. The sentence also implies that Israel made a noble gesture when it withdrew from Gaza, and that it is the fault of the Palestinians that they did not make the best of this generous gift. In fact, Israel left Gaza because it was more expedient for Israel to administer Gaza as a prison than to occupy it. The “difficult conditions” faced by the people of Gaza are the result of Israeli control over everything and everyone that goes into and out of it. The “difficult conditions” are the result of repeated Israeli bombings of critical infrastructure, and Israel’s clear plan for the complete immiseration of Gaza’s two million people. — Hamas was democratically elected by its people because it distinguished itself from the collaborationist leadership of the Palestinian Authority. Israel defines Hamas as terrorist because Hamas is determined to resist the Zionist entity. Israel’s minions in legislative bodies in other countries have been used to create the “designated terrorist” label. “Brutal dictatorship” is a buzzword applied to all political movements asserting independence from imperialist control. — Are these the same hospitals, schools, housing and factories that Israel has been bombing since 2006? Are these the same tunnels that Gazans used to bring in vital humanitarian goods not allowed through Israeli checkpoints? Doesn’t Hamas have the right to its primitive rockets when Gazans are being periodically bombarded by Israel and its highly sophisticated fighter jets? — For choosing resistance against the Zionist occupier, the Palestinian people were punished by the Zionist occupier and his servants in Egypt. The blockade is not just against weapons, it’s against any freedom of movement, and any importation of needed goods. Even people in need of urgent medical care are refused. The main purpose of the Israeli blockade is to starve Gaza, to “put them on a diet”, as one Israeli official said. To its everlasting shame, the West-installed political class in Egypt – not the Egyptian people – has chosen to collaborate. — Again, Hamas was democratically elected in 2006. One would think “the only democracy in the Middle East” would appreciate this. 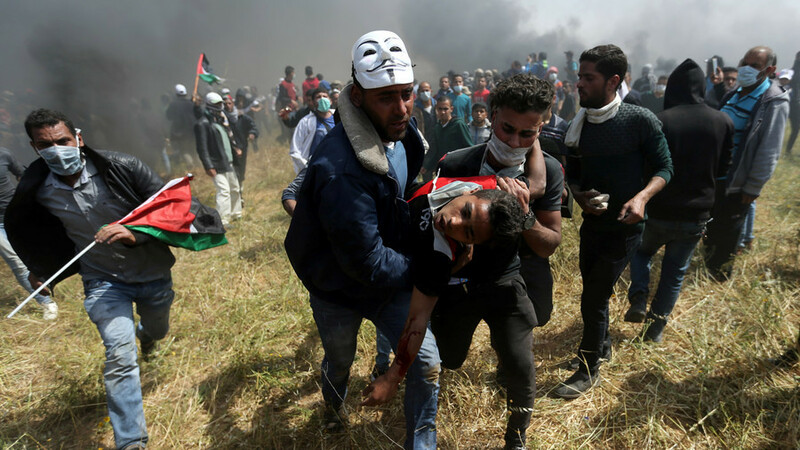 Stories of Hamas killing protesters have appeared only in the Israeli press – e.g., the Jerusalem Post, the Times of Israel. However, there are stories every day in the worldwide press of Israeli soldiers shooting Palestinian protestors all over the West Bank. Let’s also remember that the March of Return in Gaza is made up of protestors, and that Israel sent snipers there for the explicit purpose of killing and wounding them. This is not to mention the “recourse against” Hamas leaders employed over the years by Israel – namely, open assassination. — As the Borg said, “Resistance is futile.” Isn’t the promotion of the idea of an unconquerable Israel the worst kind of war propaganda? The “human shields” argument has been used by Israel as an excuse for intentionally killing hundreds of civilians during its repeated bombing campaigns. What is the “nefarious self-interest” of Gaza’s leadership? — liberation from Israeli torture. — The “dream” of the majority of the Israeli people today is to remove Palestinians from all of historic Palestine, and completely erase Palestinian history. Israelis do not “live in peace with their neighbors.” They have repeatedly attacked Lebanon, Iraq, and Syria and they are the main instigators today of conflict and war with Iran. –The main tactic of this propaganda piece is to blame the victim. Thus, nothing was done through the agency of the Jewish state and its obvious goals; everything was done as a reaction to injustices committed by Palestinians. It also turns reality on its head. Homes and schools have indeed been destroyed, but by Israel. — This is the “why pick on us?” argument. Why? Because Israel has the ugliest, most long-standing system of open colonization and oppression visible in the world today. The vast majority of the people of the world are disgusted. What Israel claims as its “borders” is stolen land. — This is the “Jew as victim” argument, made possible by unrelenting Holocaust instruction since World War II, which provides a guaranteed pass for any and all crimes committed by Jews. Since 2001, Israel, the poor victim nation, has gotten the United States to attack a long list of countries in the Middle East which Israel feels threatened by, now including Russia because Russia has thrown a wrench into Israeli plans to destroy Syria. Israel also receives massive direct funding and political cover from the United Sates. If Israel resents its status as “the Jew amongst the nations” why does it call itself “the Jewish state”? Why does it display the Star of David on all its national symbols and armaments? This is an identity which Israelis promote – how can they now turn around and blame us for it? — The idea that it is the Israeli Occupation Forces who have suffered because they have had to kill and maim defenseless Palestinians is a perfect example of what Zionist supremacy and racism is. It is a form of self-worship and psychopathy in which one is never responsible for committing any wrong — it is always the fault of the other. This sentence is reminiscent of Israeli Prime Minister Golda Meir saying: “We can forgive the Arabs for killing our children. We cannot forgive them for forcing us to kill their children.” In other words, the real crime has been committed against Jews, whose purity has been sullied by having to kill innocent people (as they were invading their land and homes). This belief of Jewish superiority above others is at the bottom of everything Palestinians have suffered for the past 70 years. –No, the ” frustration” Palestinians feel is from being consistently and sadistically blocked from life and liberty by the Israeli prison-keeper. The real manipulators are those who would have us believe the oppressive tactics of Israel are of the Palestinians’ own making, as this sentence implies. — Again, no recognition that this “tragedy” might be in any way the fault of Israel. Israel is supported, not by “the Boston Jewish community” but by a cynically propagandistic Washington-based lobby for Israel, the Jewish Council for Public Affairs, which provides the political line for 125 supposedly local Jewish Community Relations Councils in the US. In other words, a political lobby for a country 6,000 miles away says they speak for all Jews in Boston. In 2016 the Jewish Community Relations Council of Boston sponsored a deceptive anti-boycott bill in the Massachusetts legislature. They were successfully opposed by a large number of Jewish activists in the state, and many others. The Council now claims to represent the Jewish community of Boston in mobilizing opposition to a motion in the Cambridge city council to boycott Hewlett-Packard. When was the vote in which “the Boston Jewish community” elected this Council? Who is the real manipulator in this scenario? Doesn’t the Jewish Community Relations Council actually represent a foreign political movement — not Cambridge, not Boston, not Massachusetts?